I believe that in the UK and US there is a lack, nay absence, of pragmatic computing education which matches the needs of the current business world of information technology (IT). Current computer education, school and university, appears to me to be computer science based, very theoretical and does not follow the logical sequence of activity in the development, use and management of business applications that I observed in my long IT career spanning many industries. In fact, the curricula appear to me to be a collection of topics with little synergy and no end-to-end flow which IT projects have. As an analogy, consider the following scenario which I believe is a parallel to this. A technical course on the motor car is run at Knowalot College, covering the internals of the car; Carnot cycle, adiabatic expansion, electronic ignition etc. ; very detailed and demanding. At the end of the course, the student will probably have no concept of the motor car as vehicle, might not know how to drive, read a map or plan a journey from A to B. It is almost certain that he/she will not know how to decide on which car, van or lorry to recommend for the business he works for. In short, he/she is doomed to be a head-under-the-bonnet techie forever. That job of course is necessary but it cannot be classed as covering "motor transport," simply a technical corner of it. Not only that, but the words "business" or "requirements" do not even appear anywhere in CS curricula I have searched. Only under the title "problem solving" could one guess that it refers to business. This is not to say CS education per se is bad; it just isn't a comfortable fit to the current computing world although it is gradually finding a niche in various areas of computing. These areas include big data, data science, cognitive and similar computing, and cybersecurity. However, a broader knowledge across key IT concepts and architectures is needed since no person in IT is an island and anyone totally specialized will find it difficult to cross-communicate where his/her field overlaps with another, particularly in meetings or presenting to the business. ■ IT needs to be presented as sequence of related activities within a framework, not a simple collection of topics. You can see "coding" in context here; students and teachers cannot see this far. ■ There should be a pragmatic, contextual "wrapping" around major topics, for example, "this is used in the oil industry to map the subsea strata in the search for oil deposits." – the "so what?" test. These are the criteria to map onto any business IT project to whatever degree of detail (reflecting its importance) the business decides. ■ Two large topics totally absent from CS curricula are mainframes, their operating systems and high performance computing (HPC). Much of the world's financial work is done on mainframes and its influence is growing, believe it or not. HPC computing is now a big field and is expanding beyond pure science into medicine, financial modelling, AI and other power hungry areas. Not to even mention them is dereliction of IT teaching duty, whatever the syllabus mandates. This sort of add-on could be done by selection of a suitable reading list, even if it is not in the syllabus. CS school and university syllabuses I have studied do not fit the "real world" IT scene in breadth, depth or velocity of change and I therefore generated a keyword list to demonstrate this dichotomy. The list then developed into a learning Glossary, now on Amazon Kindle (check tomorrow for Part 2 of this blog), to show where IT fits in the business world and the topics which make it tick. The CS world can then see if their output matches these requirements. So what? The world has gone mad on the "digital revolution" impacting nearly all business. I believe this issue needs to be addressed vigorously and quickly to tackle the much discussed "IT skills shortage." The current computer education, at least in the UK, will not achieve this aim, still less cater for the skills needs post-Brexit. I see no difference between UK CS and US CS, ergo much of what I say also applies the US. Finally, I cannot find a syllabus anywhere I have looked that remotely covers IT as demonstrated by the list and subsequently the Glossary. I see this as a start in resolving the "IT Skills issue," a mantra that has been trotted out since the year 2000, if not earlier. As Mark Twain said; "Everybody is talking about the weather, nobody is doing anything about it." I hope the Glossary is a beginning. 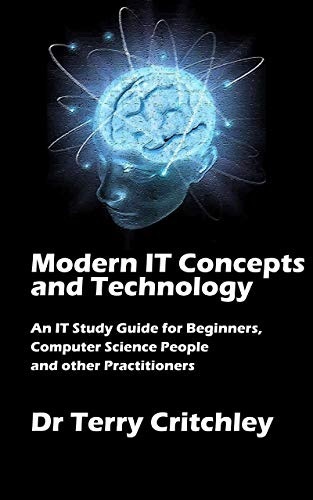 Purchase Dr. Terry Critchley's New Book: "The IT Glossary: Information Technology Concepts and Topics Defined and Explained"